On the way back from being shut down on the Petzoldt ridge, Keith pointed out an interesting ice line he had seen on a previous trip to the Lower Saddle. 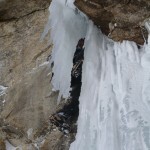 The forecast called for perfect weather — a cold night and a calm, sunny day — and ice is Keith’s natural climbing medium, so he was interested in repeating the Garnet Canyon trek to give it a try. Keith is a good partner, and I enjoy climbing ice “in the wild” when I can, so I was game despite my dread of not being able to follow something he led. Sure, the guidebook didn’t really say anything about it, but adventure can be healthy when it’s not fatal. We managed the same unholy 4-something-AM start as the day before, but with even more gear, including ice screws and actual pitons, which I am more used to seeing rusted and welded into cracks. We met our friends at the Meadows again, in much better spirits on a calm, sunny morning, then began the slog up toward the Lower Saddle. The previous night’s storm had left much more snow, with perhaps six inches of fresh powder over the hard-frozen old stuff. 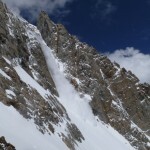 This made for a slow grind up the headwall, and conditions did not improve on the moraine. 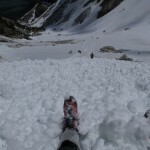 We easily located the couloir west of Teepee Pillar, and promptly descended to new depths of suffering. 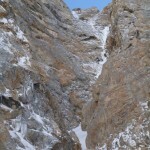 Once it melts out, the chute is a nightmare of loose scree, which was starting to peek out near the bottom. 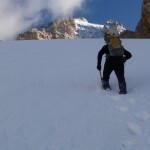 Farther up, the previous night’s snow was knee- and then waist-deep, and we wallowed for an hour and a half between the moraine and the base of the ice. The sight of beautiful ice kept us going, but it was grim, gasping work. 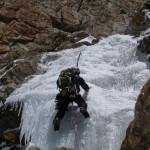 After gearing and fueling up, Keith tried to start directly on the right-hand column, but while it was basically climbable, the ice was too thin and soft to hold a screw, and it was a bit tall and steep to solo. Returning to ground, he found a slanting mixed start to the right, which reached the top of the first column near a chandelier. 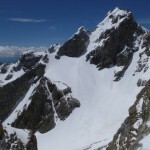 An exposed step-around got him back to the obvious route, where steep ice and “snice” (vertical, opaque snow with a crust) led to a low-angle snowfield and a good, sheltered belay spot. It was tough climbing, with lots of excavation to look for solid placements, and one scare as a block of snice dropped out from under his feet. Standing below, I was glad I had a helmet. Following P1, I managed a couple of precarious moves near the bottom of the mixed, planted a tool on the far side of the pillar, and hooked it with the other to step around. After that, the cold and wet really started to get to my hands, and I spent plenty of time shaking out. The snice section, which looked like a reprieve from below, was surprisingly difficult, especially after removing a screw that Keith had placed directly under a drip (the only place solid enough to hold it). 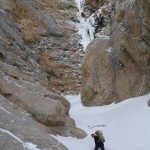 Pulling over onto the snow, I was relieved and amazed that I hadn’t fallen, hung on the rope, or dropped a tool. That lasted for about 10 seconds, followed by a couple minutes of pain as my hands thawed. P2 started with a chimney with ice on one side. From below, it looked like it should be easy to stem up and out, but it was not that straightforward. The exit was a pull-up on more vertical snice, with weird, dubious feet. 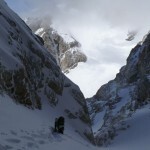 After a short break, there was another steep, rotting step to reach the next belay. I started the chimney back-stepping on some rock features to the left while working my right foot and tools up the ice, then moved to the vertical right-hand side. After a strenuous hang to remove a screw, I somehow planted both tools high and pulled over the bulge without having anything blow. I thought I might be home free after this — the rest didn’t look too steep — but there was another steep step above. Warming temperatures made parts of the surface useless, and since it was all opaque and similar-looking, I had to hack away until I found placements, sometimes digging at snow, other times painfully slamming a tool into underlying rock. 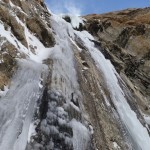 Reaching the next snowfield, I was relieved to see that the final pitch looked short and moderate: I was getting tired, the sun was finally reaching our ice, and we had been listening to other ice fall off in the sun all morning. 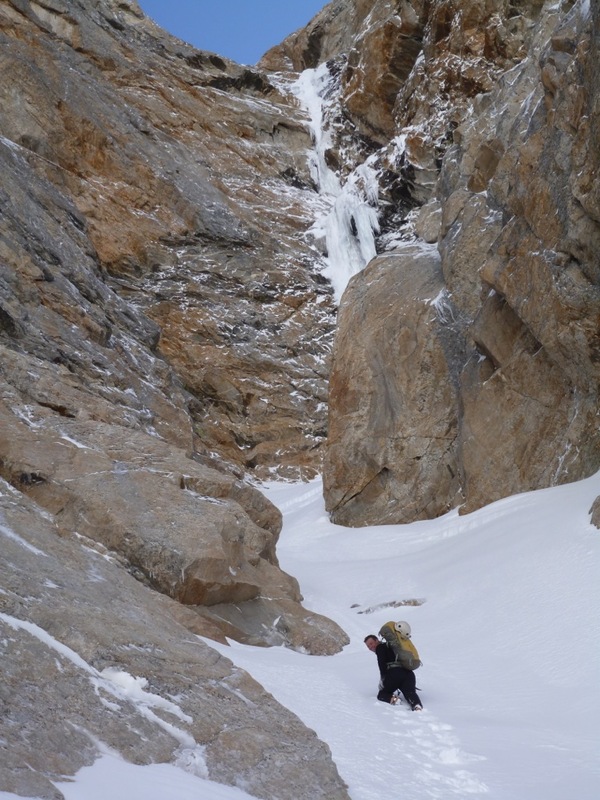 After walking up some low-angle slush, Keith put in a couple of screws at the base of the final ice step, then romped up some hero-ice to Teepee Col. 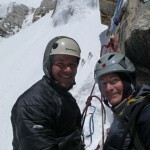 It was a great finish to some exhilarating climbing. Since it was some of the hardest ice climbing I had done, I was surprised and pleased to have climbed the whole thing clean — no hangs or falls — but incredibly glad I was not on the sharp end. The climb tops out at the head of the Teepee glacier, so we put away gear and prepared for a nice glissade. While resting and admiring the Grand’s east ridge and face, we heard and saw a huge avalanche launch off the Grand’s upper southeast snowfield and down the east face. I jumped for my camera, and managed to catch at least some of it in pictures and video. It was an awesome thing to watch from a safe distance. On the glissade, we did our part for avalanche control: Keith set off a good-sized slide coming down the Teepee glacier, and we both managed to plow the fresh snow off the headwall leading down to the Meadows. The latter startled an Exum guided party coming up, but hopefully they appreciated our efforts to keep them safe. An hour and change later, we had beaten feet back to the car, to finally rest our badly beaten feet.